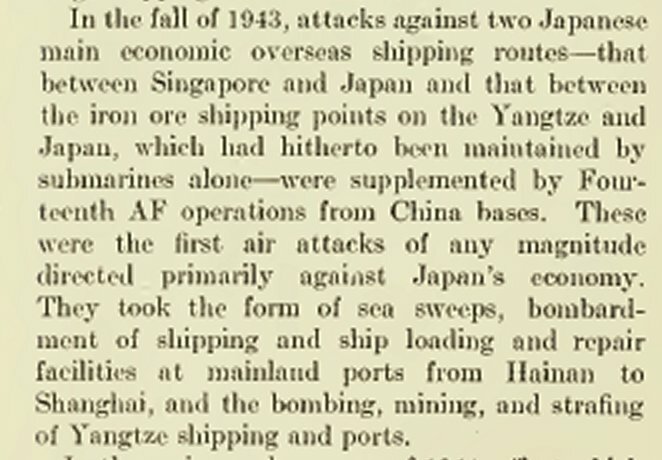 Formosa and Korea come under Japanese control. 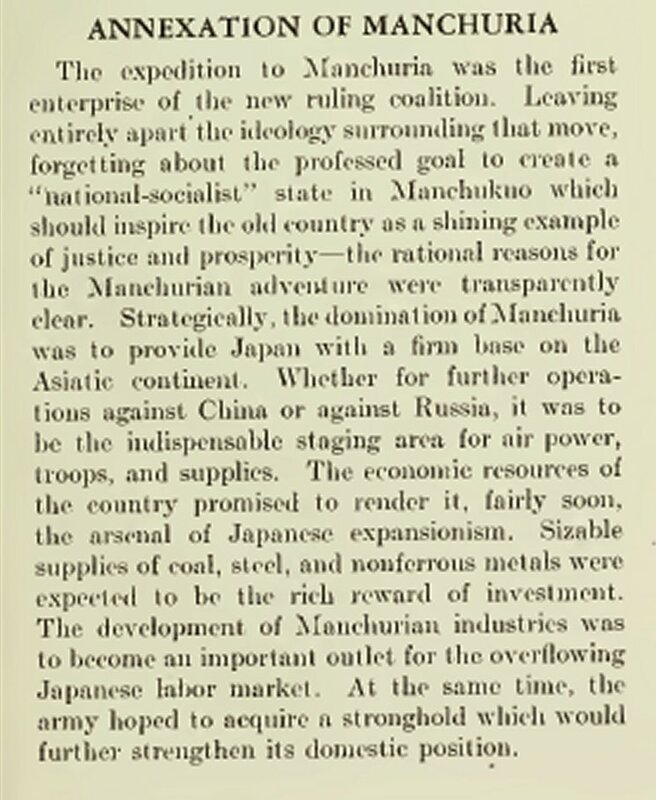 Taking Manchuria didn't bring the profits they thought it would. Japan's big business didn't move quickly enough. 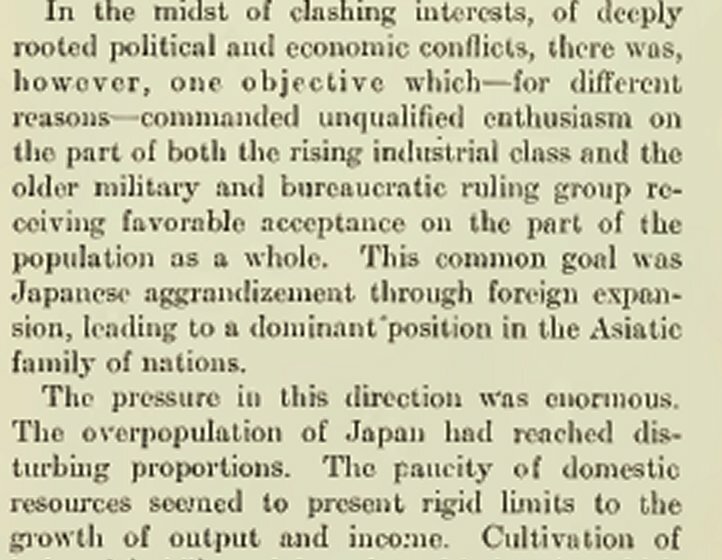 The importance of the Army in Japanese policy grew. They didn't expect a major Chinese war. 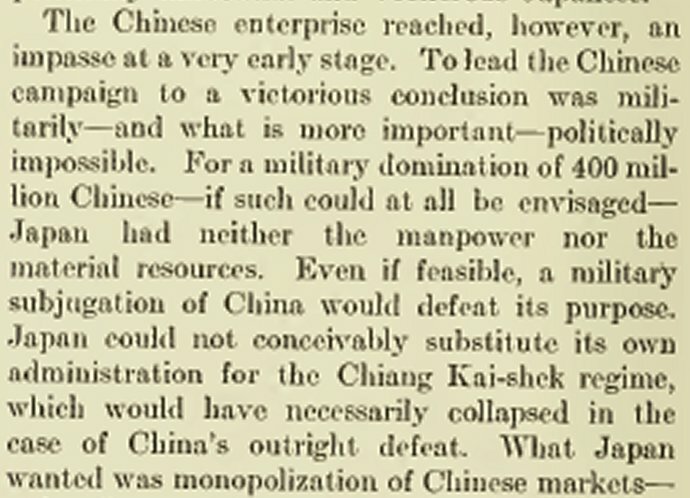 Taking over China was virtually impossible. They couldn't ultimately win, but withdrawal was also not an option. The Japanese did not plan for the long haul. 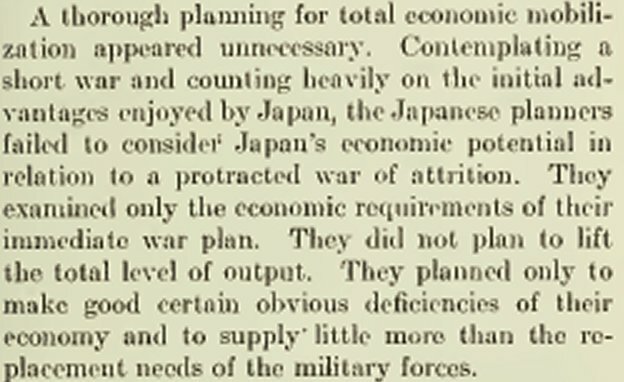 The Americans far out-performed the Japanese as far as conversion to a war economy went. Food and clothing for the military meant less for the civilians. New local construction dropped. Money flowed out to the government. 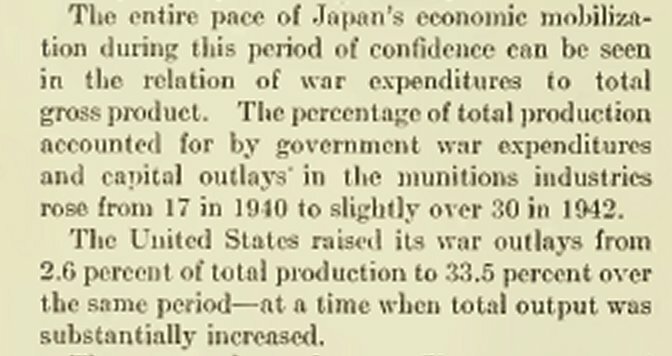 The amount of money allocated by the United States to the war effort was much higher than what the Japanese allocated. 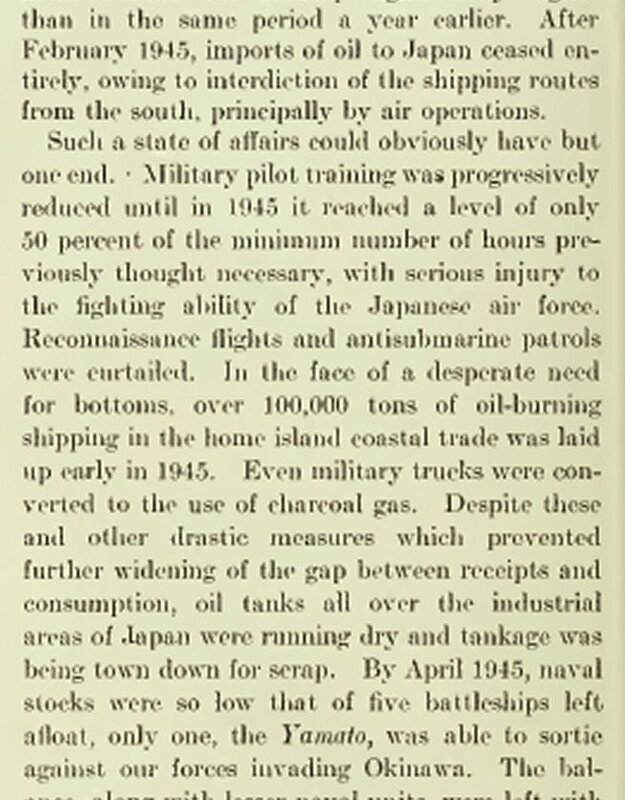 Military problems began to crop up for the Japanese. The civilian economy was pared to a subsistence level. The standard of living fell strongly. 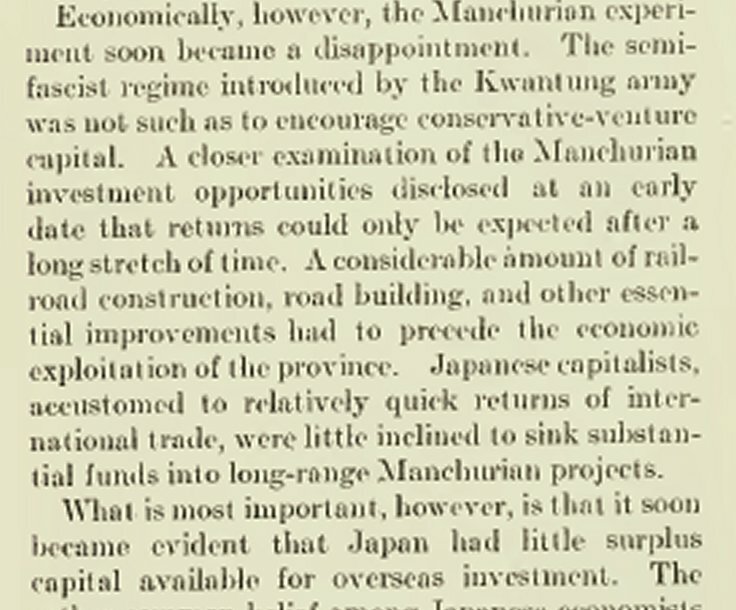 The peak of the economy for the Japanese was fiscal 1944. 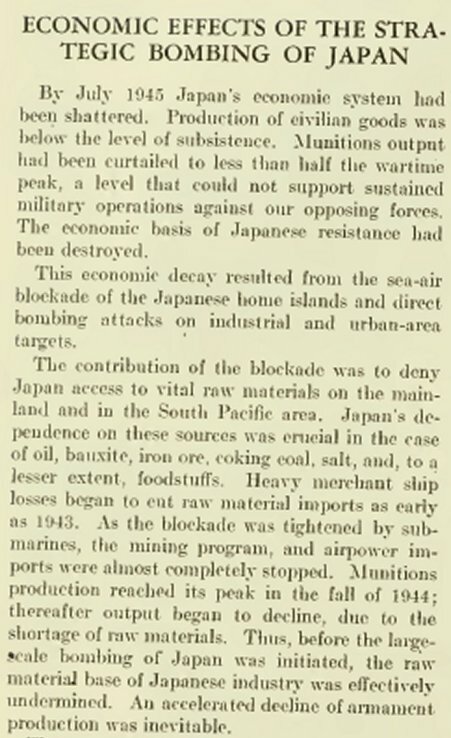 The Japanese quickly seized certain raw materials at the start of the war. The stress of production was on the wrong things. 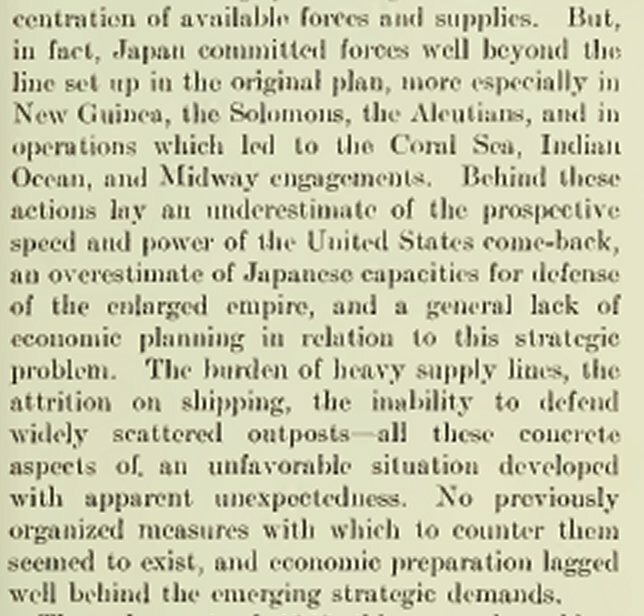 Japan sent their forces out well beyond what they had originally planned. 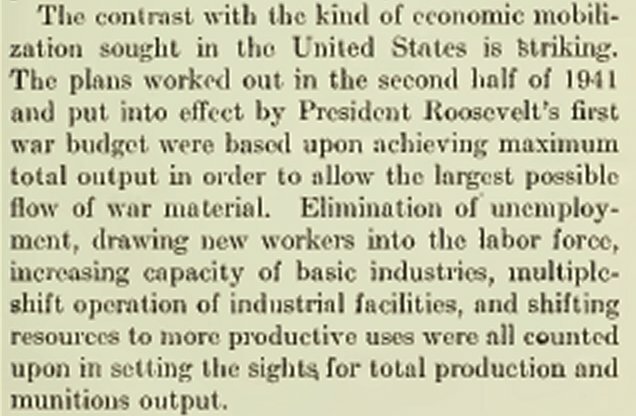 They also did not count on the speed and productivity of the United States economy. The battle of Guadalcanal brought heavy losses to the Japanese military. These kind of losses could not be replaced easily nor quickly. Guadalcanal proved to be a turning point for their economy. 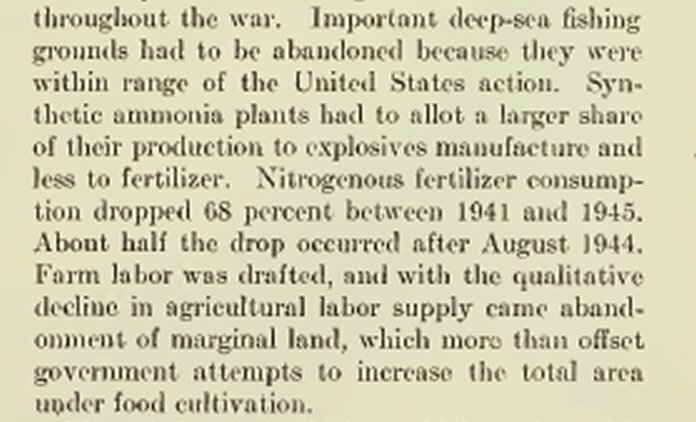 They did not produce enough munitions. They seriously under-calculated how much shipping they would need and how much would be sunk by the U.S.
Workers in Japan could be forced to stay in the same industry. 1944 was a peak year for their output. After that it was pretty much all downhill. The foundations of their industry started to crumble. Children were drafted to work in the factories. They never solved their labor problem which meant fewer things like airplanes could be produced then they desperately needed. Production of naval guns, ammunition and other things fell below earlier levels. The peak level for industry was early 1944. It's one thing to have a labor force as such, but quite another to have one with skilled workers. Over three million students were placed into factories by the end of the war. Resources for the civilian economy were low. The food situation was very important. 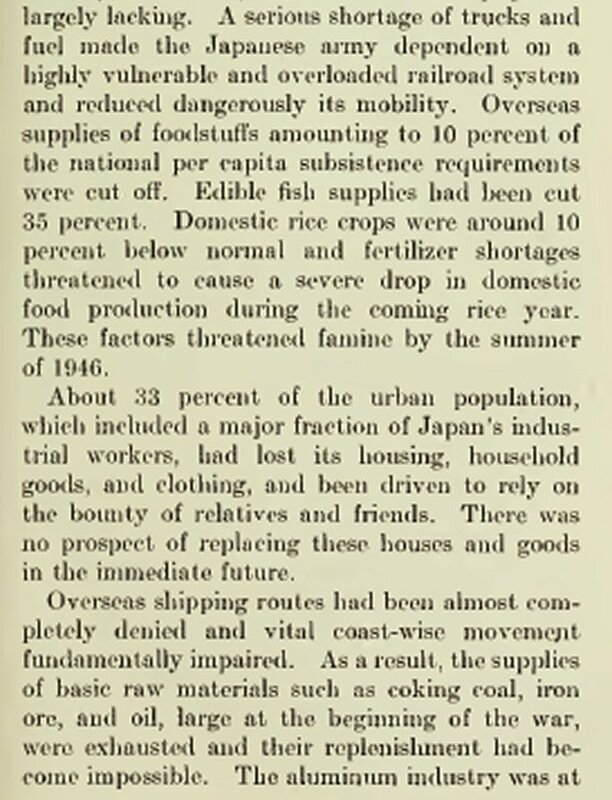 Domestic food production fell, and food imports were subject to the ships carrying them being sunk by American submarines. 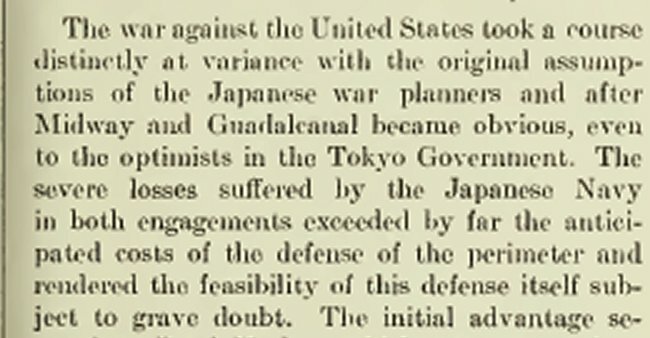 One of the main problems for Japan was that they severely under-estimated what the Americans would be able to do in the war. A lot of Japanese housing and small businesses were mainly wood construction, and when the firebombing problem started that led to massive destruction of those homes and small businesses. 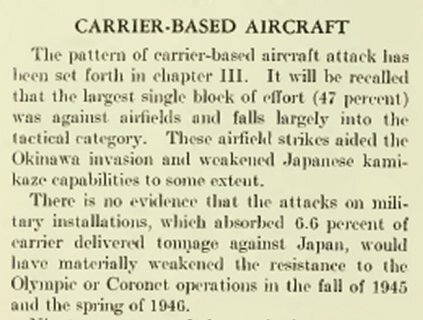 In addition, Japan had not prepared any major air defenses for the home islands. They also did not have enough fire-fighting equipment or enough shelters. As you can see American air power grew. 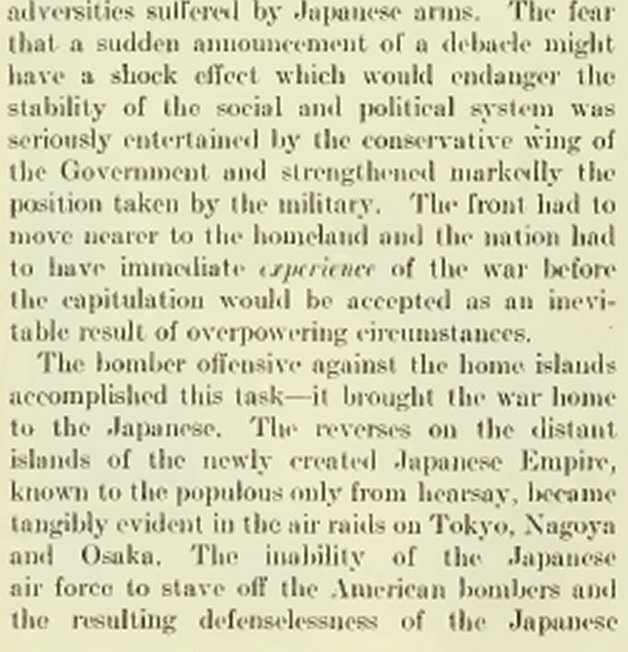 This was at the same time that Japanese airplanes had been pretty much neutralized except for the kamikaze. The Japanese had also lost most of their best pilots already, leaving poorly trained ones to man the attack aircraft left. 28% of all bombs used against Japan were used on the home islands themselves. It did take the Americans years, though, to battle through the Japanese-held islands to get to places where they could build air bases close enough to Japan to make bombing on a massive scale feasible. The original bombing offensive was figured to be the opening to an actual invasion of the home islands. There were two main aims of the air attacks; first, make the blockade of Japan stronger, and second, attack industrial and urban targets. Early air attacks were launched from China. By October of 1944 American forces were near enough to Japan to make air bombing feasible. 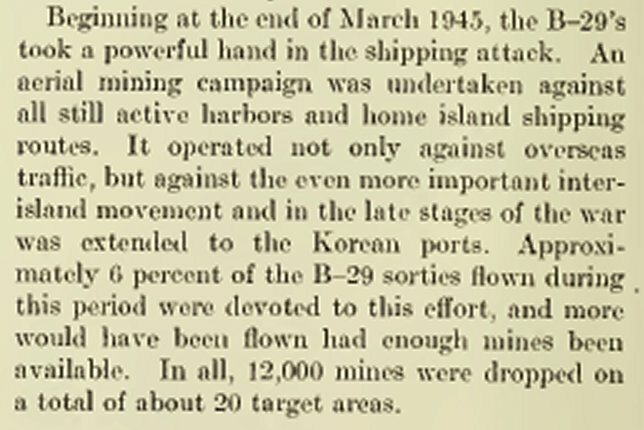 B-29s were used to help in the mining operations. 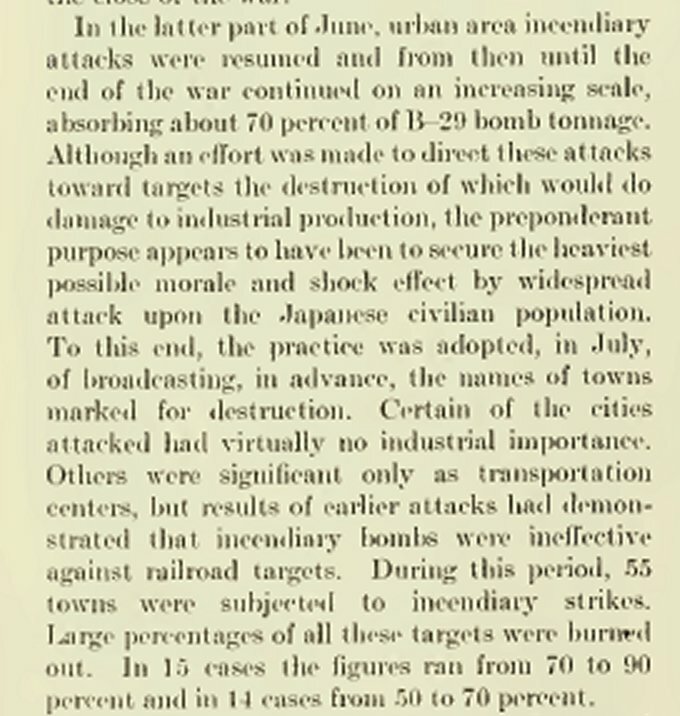 The actual bombing attacks did not start off very well but, as the war went on, the kinks were worked out of the system, making bombing much more effective. 55 towns were firebombed. Destruction of some towns was as high as 90%. 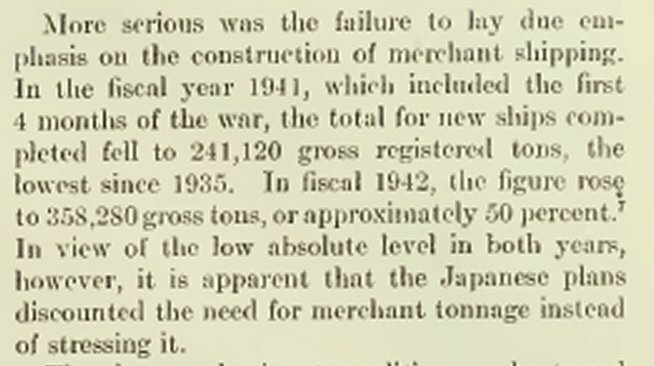 By August of 1945 the Japanese war economy was bankrupt. Trucks and fuel were in short supply. Fish supplies had fallen 35%. Domestic rice crops were down 10%. Around 33% of the civilians homeless. Overseas shipping routes had been pretty much shut down. Coal production had fallen considerably. Their marine shipping fleet wasn't big enough at the start of the war and it went down rapidly due to the actions of American submarines and air attacks. 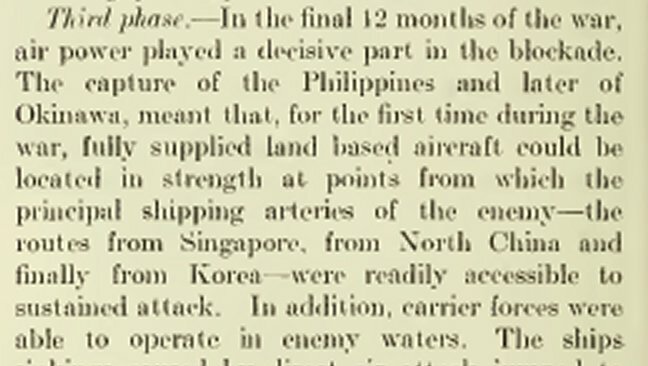 Air power played a major role in the blockade. The aerial mining was also significant. 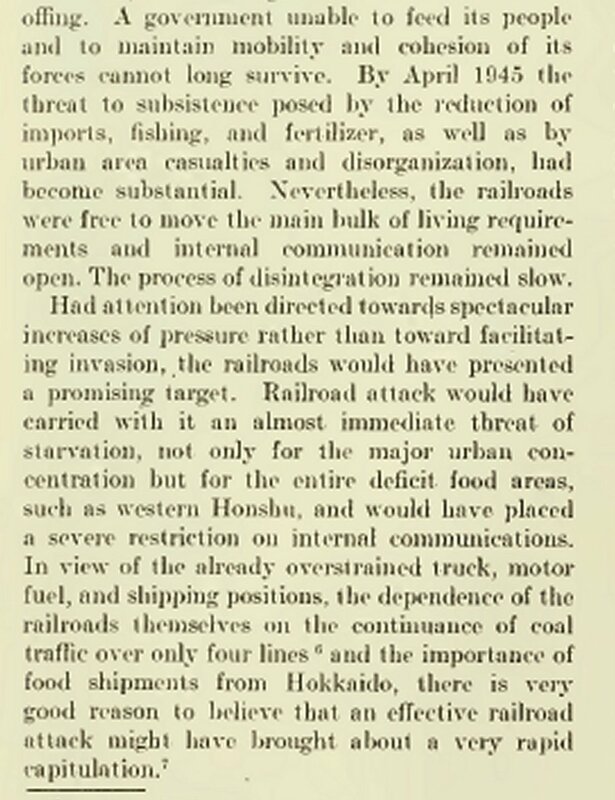 Much shipping of goods went to the railroads which, for some reason, were never really attacked properly. 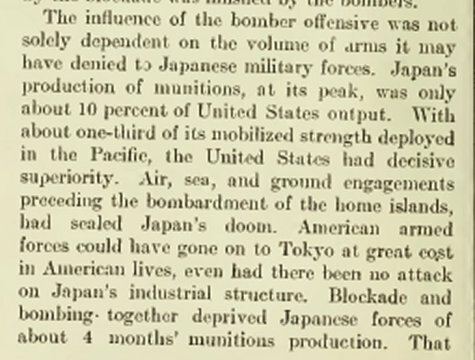 The Japanese steel industry was inadequate for a war situation. The oil situation was not good, either. 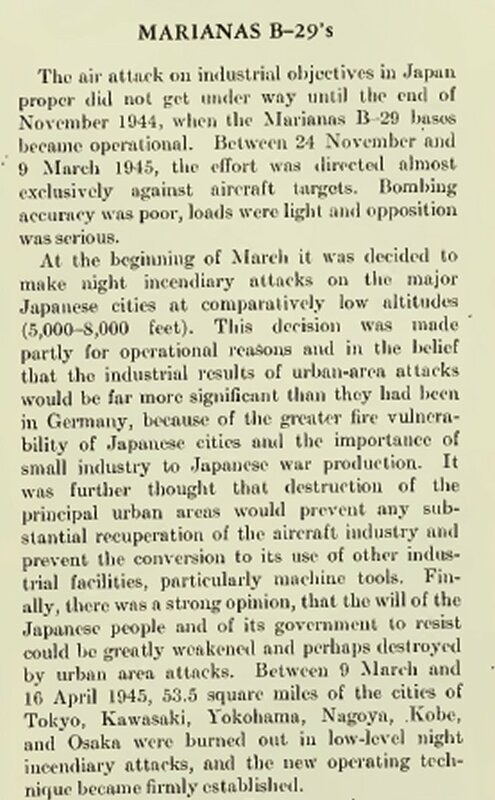 Aircraft production was given top priority by Japan. This was hurt by irregular engine output. 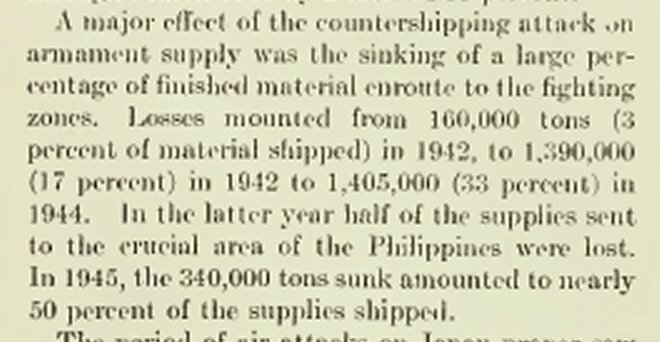 In 1945 half the supplies shipped to Japan were sunk. 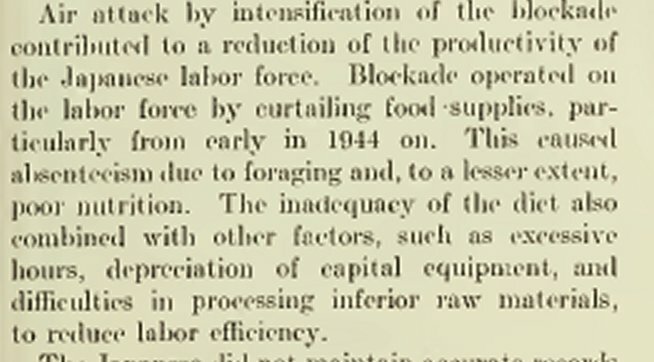 The air attacks also had a result on the labor force. 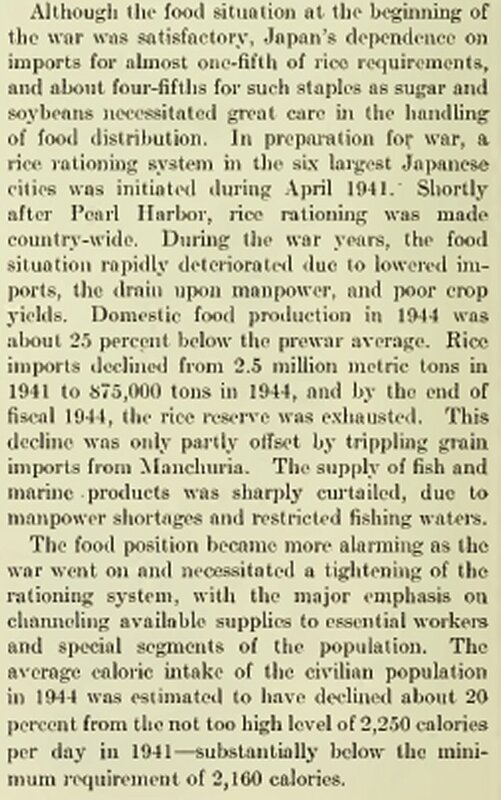 Even at the start of the war the food supply was not good. Deep sea fishing grounds were abandoned and men were drafted from the farms. Fishing vessels were taken by the military. Urban area attacks further complicated the food problem. Imports of goods for civilian use fell sharply. Some 13 million people were made homeless. 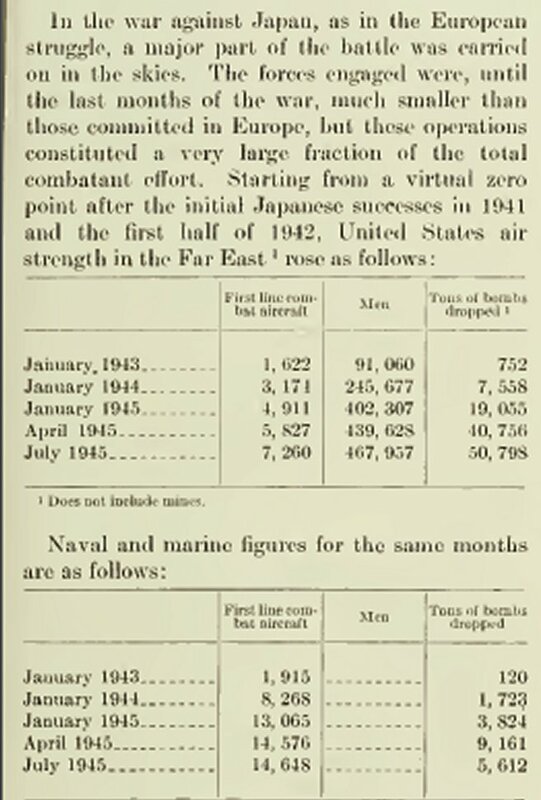 The loss of the Japanese navy was a major blow. Japan started suffering one defeat after another. Only a fraction of needed military goods were produced. The military was defeated, but the politicians didn't feel they were defeated. A peace movement started as far back as Saipan, but fanatics squashed it. 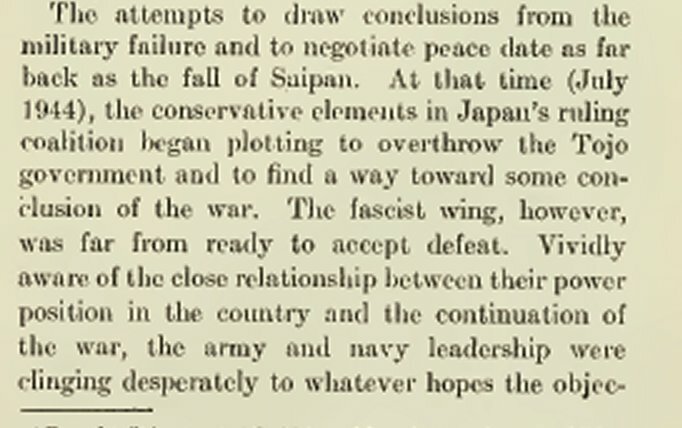 The facist wing in Japan was still in control. The Japanese couldn't stop the American aerial offensive. Popular despair went up, war production went down. 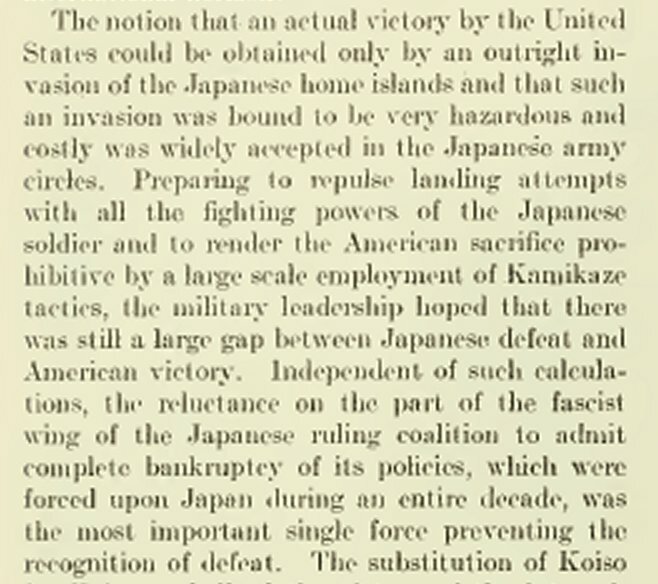 The Japanese figured an invasion of Japan would result in 'death with honor' for them. 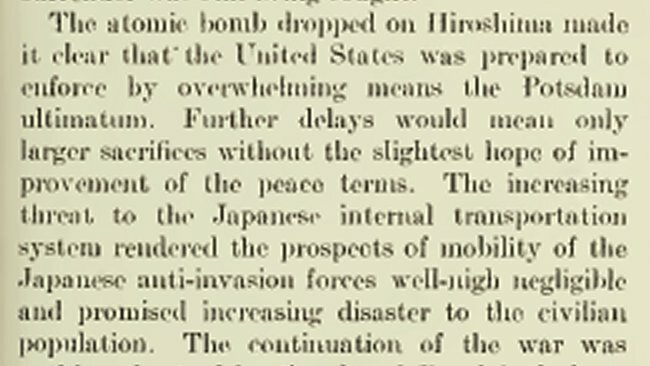 The atomic bombs proved how serious the United States was in prosecuting the war. 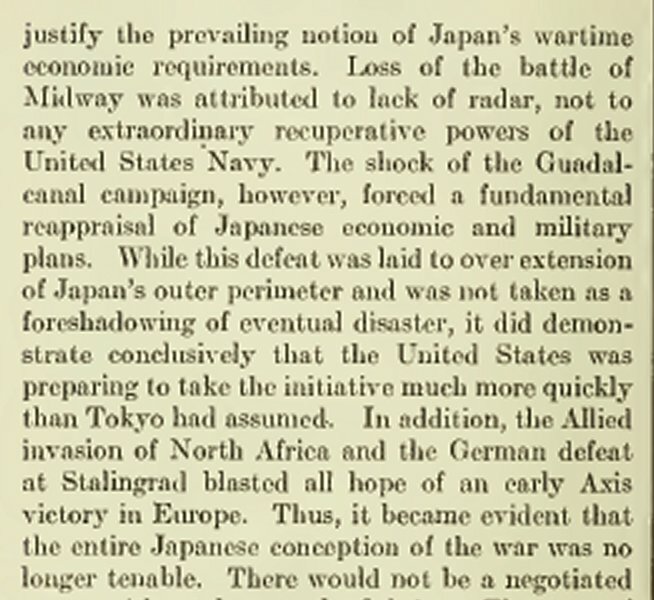 The aerial offensive was the major factor in Japan's surrender. The Eastern Air Force was preparing for the actual invasion of Japan itself. Someone finally figured out destroying the Japanese railroads was a good idea. 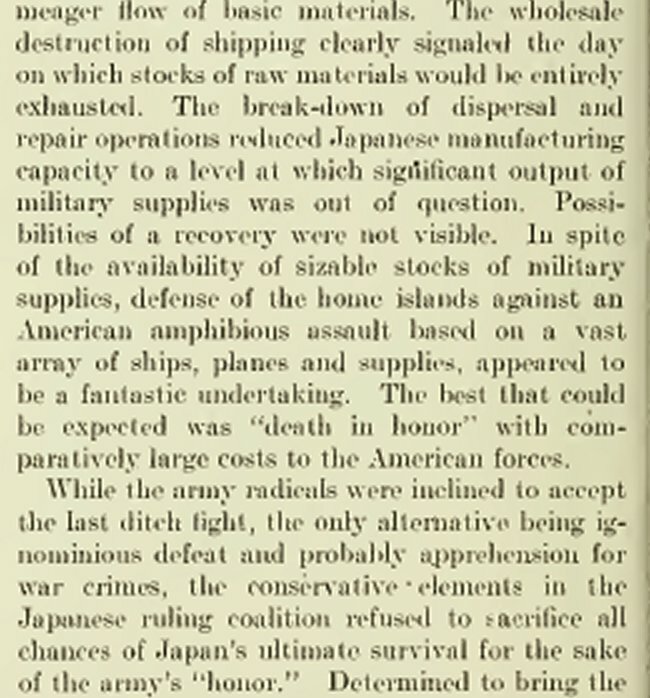 Japanese beachhead resistance depended on various things. 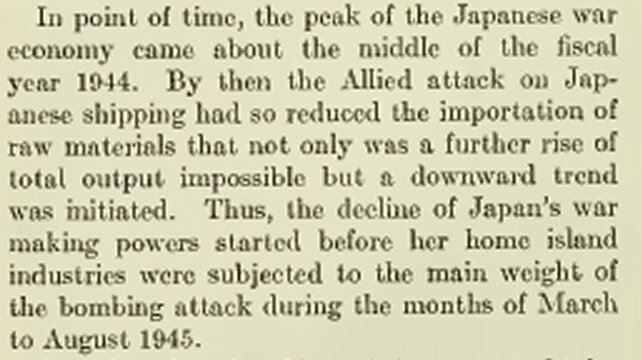 What is not in the report is that the Japanese had a very large number of kamikaze planes waiting. They also had kamikaze subs and even guys that would strap explosives to themselves and swim out to landing boats to blow them up. There was one plan, though, which postulated that the United States would have at least nine atomic bombs ready for the invasion. Three were to be dropped on the beachheads, three move a little ways behind them, and three were to be held in reserve to drop on any massive Japanese troop reinforcement movements. Attacks on military installations would have been carried out by aircraft carrier planes. The goal of the strategic bombing was to reduce the strength that the Japanese could apply against an American beach invasion. If a government cannot feed its people at all, sooner or later it will fall. If the railroads had been destroyed (which they should have been much earlier), that alone might have led to Japan's surrender. It would have destroyed the ability to ship almost anything in Japan. If this had been done, the war might have ended sooner. The report starts out with the conclusions first. What the blockade did and how it was accomplished. Impact on the aircraft industry. Migration of people out of the cities. 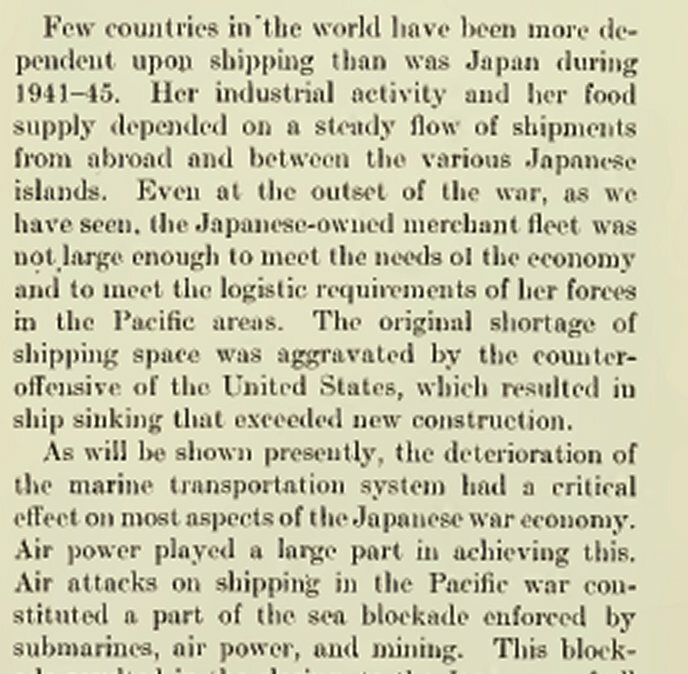 Effect of defeat and the blockade. Bombing and the agreement to surrender.